I've had a few electronics kits kicking around for years now that I'd never sat down and put together. At a glance, these kits all seemed like they were designed to be soldering practice that resulted in a fun gadget at the end of the day. All the magical functionality always was always hidden in black-box integrated circuits, so I could never figure out exactly how the circuit worked, and this frustration (combined with my poor soldering abilities) left me without much desire to do much with them. 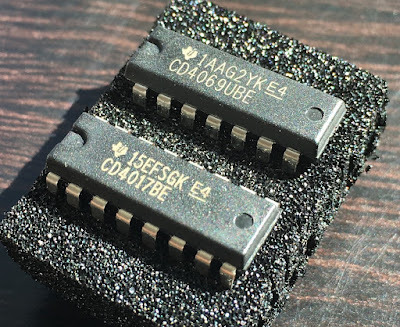 Very recently though, it occurred to me that we now live in an age where the datasheets for many of these black-box chips are online, and it's now actually possible to pull back the curtain on what they're doing under the hood. As it turns out, most of them are a lot simpler than I would have guessed. 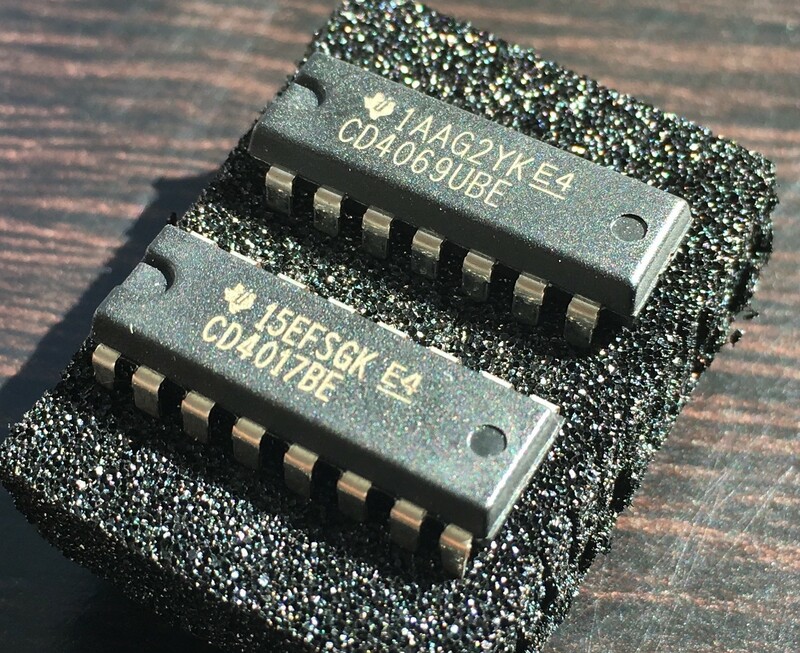 And after digging through my old kits, I also realized that they are often just simple IC components that are connected in clever ways to achieve their perform their magic. With this epiphany and newfound confidence understanding how these kits work, I set out to learn something new about electronics. And given that my background in electronics has been limited to a week of electronics camp at age 13 and an 8 AM physics class in college, I figured my odds at accomplishing this were pretty good. This endeavor started with a Spinning LED Wheel kit by a Belgian company called Velleman. It's a simple LED roulette wheel circuit where, upon pressing a button, a light spins around a ring of ten LEDs very quickly at first, then slows and eventually stops on a single "winning" LED. The kit comes with a couple resistors, capacitors, LEDs, and two DIP chips, and is really inexpensive. It would be a lot easier to experiment: changing resistors and capacitors to see what would happen would help me understand which circuit components are the most important. It would be easier to rebuild and improve the circuit with additional features later on. It would be easier to interface with my Raspberry Pi for debugging and improvement. It's a lot harder to screw up assembly when a soldering iron is not required! 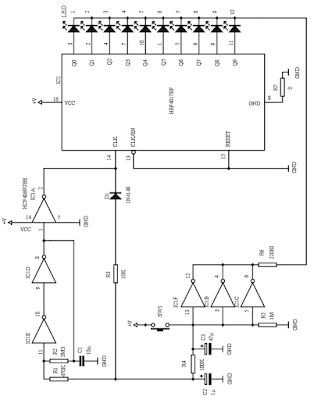 The CD4069UBE chip is just six NOT gates (inverters) stuffed into a DIP package. When the input pin (CLK) is first lit up, output first output pin (Q0) is lit up. The next time CLKis bounced (turned off, then turned on again), the first output pin (Q0) turns off and the second pin (Q1) turns on. This cycle repeats every time the CLK is and wraps around back after the tenth pin (Q9) is lit up. Not having any practical experience with electronics, I had a hard time understanding exactly how this circuit was working. The CD4017BE IC is certainly central to this circuit's operation, and I understood that every time the voltage going into the CLK pin went up and back down, a new LED would light up. I also understood that resistor-capacitor series have time-dependent behavior that can be used to make voltages go low and high in a very predictable manner, which could drive the CLK pin. But how do these concepts translate into a wheel that spins, slows down, and eventually stops? Since the C3 capacitor is the biggest one in the kit, it made sense that this is probably what drives the entire circuit after the switch is opened and the battery pack is no longer connected. And indeed, replacing this C3 capacitor with one of smaller capacitance causes the roulette wheel to spin for a much shorter period of time before shutting off. 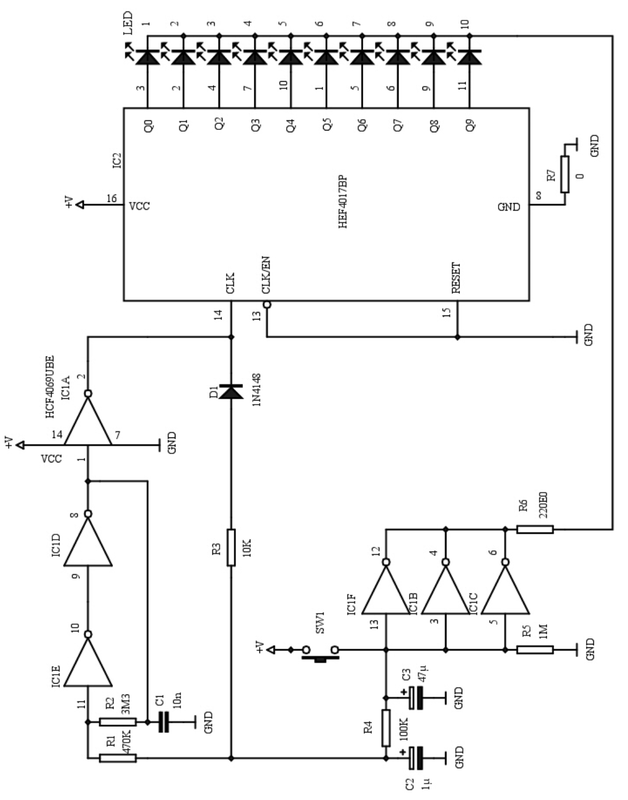 The combination of the 1 µF capacitor (C2) and the 100 KΩ resistor (R4) looks a lot like an RC series that can be used as a timer to drive the other half of the circuit. And again, changing the capacitance of this capacitor changes the speed at which the LED wheel "spins." The NOT gates (inverters) are directly connected to the C3 capacitor driving the whole circuit, so they are probably acting as a shutoff mechanism. After the C3 capacitor discharged enough (effectively turning "off"), everything on the other side of the inverters (IC1F, IC1B, IC1C) switch on. Since there are nothing but our LEDs north of these gates, this reversal of polarity would cause the LEDs to shut off for good. The other half of the circuit is what drives the actual CLK signal that causes the LEDs to light up in order. It effectively converts the analog signal coming from our RC series into a digital signal that drives the CD4017BE decade counter. 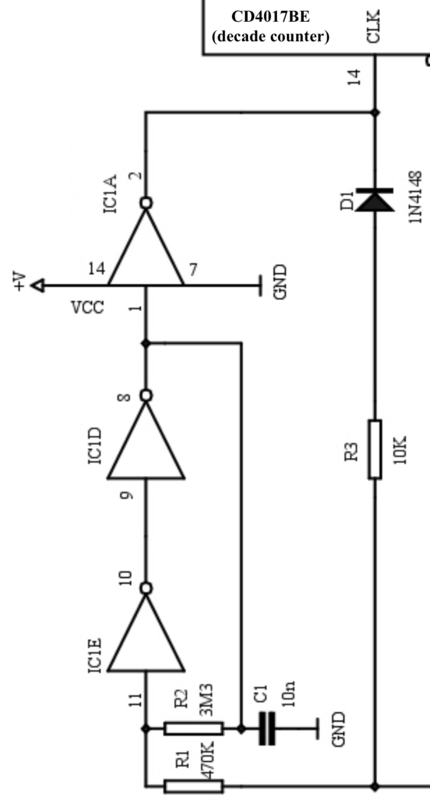 The IC1A inverter is what holds the CLK pin high (on) when the rest of the circuit is completely discharged. This means that full CLK signals (going fully on, then fully off again) are driven by this IC1A gate being momentarily shut off, since its default state is high (on). The 10 nF capacitor (C1) is a bit of a red herring. 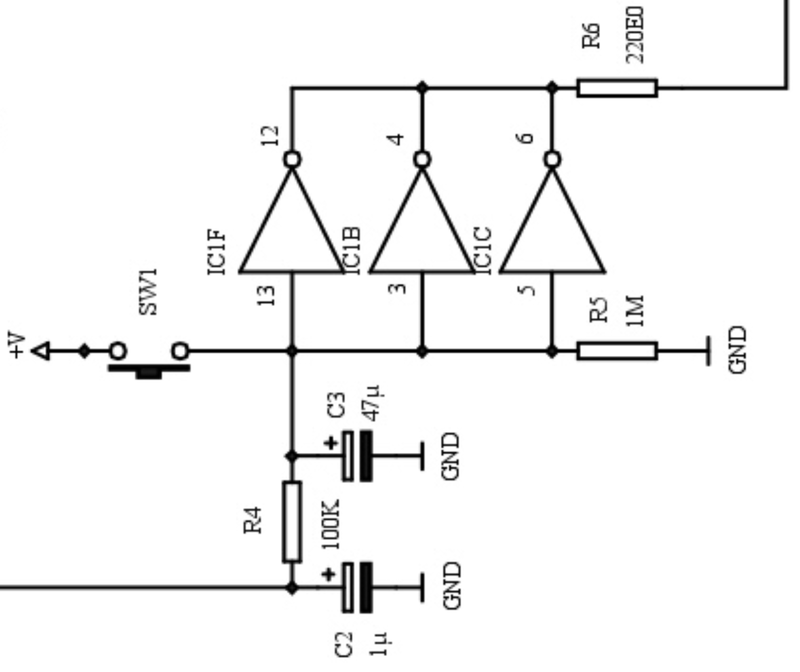 The CD4069BE datasheet recommends conditioning power using small capacitors like this, and that's exactly what this component does--removing it doesn't actually affect the rest of the circuit under normal conditions. The combination of the 3.3 MΩ resistor (R2), the 470 KΩ resistor (R1) and the IC1E and ICD1D inverters form a pulse shaping circuit. 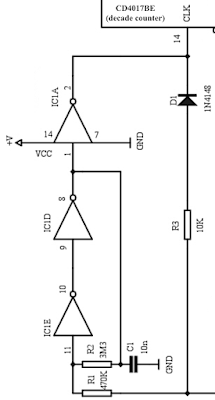 This converts the falling (analog) voltage coming from the 1 µF capacitor (C2) on the input section into an unambiguous high or low (digital) voltage that drives IC1A, which in turn drives the CLK signal. As a fun exercise in both programming and understanding the digital aspects of this circuit, I then thought it would be fun to replace the CD4017BE decade counter IC with a Raspberry Pi. This is admittedly a very silly thing to do--that is, replacing a simple IC with a full-blown microprocessor running Linux--but I wanted to see if I could replicate what I thought the CD4017BE chip was doing using the Raspberry Pi's GPIO pins and a bit of Python. Since the Raspberry Pi only replaces the CD4017BE chip (and the battery pack), the physical button still has to be pressed to activate the circuit after the above Python script is started. Once it's pressed though, the LED wheel works just like before! This Python version of the decade counter logic doesn't have to stop here though; for example, I went on to implement the full CD4017BE chip in Python (including pins we don't use in this project like CARRY OUT and CLOCK INHIBIT) just for fun. It would be trivial to also implement the CD4069UBE's NOT gates too and convert this kit into a real Frankenstein circuit. 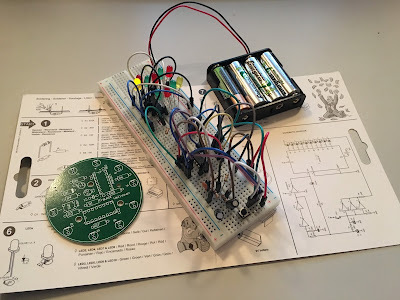 This Velleman MK152 kit turned out to be a really fun project to start learning about both analog and digital circuitry. Once I realized that IC datasheets are easily and freely found online nowadays, the idea of understanding the circuit became tractable. This gave me a basis on which I could experiment; I could easily prod different segments with a multimeter, try to guess what would happen if I removed or replaced a component, then actually perform the experiment. For example, I found that messing with the C2 and C3 capacitors changes how long and how quickly the roulette wheel spins, and sticking a passive piezo buzzer in parallel with the CLK signal adds roulette wheel-like sound effects too. This kit is really a neat demonstration of a digital circuit using pretty simple analog and digital components. What's more, it's a great boilerplate design for how analog components like resistors and capacitors can work with the Raspberry Pi. The decade counter and inverter DIPs are also versatile components that can be used in other projects; this contrasts with many of the electronics kits that ship with a full microcontroller which, despite being able to perform more complex tasks, are truly black boxes. 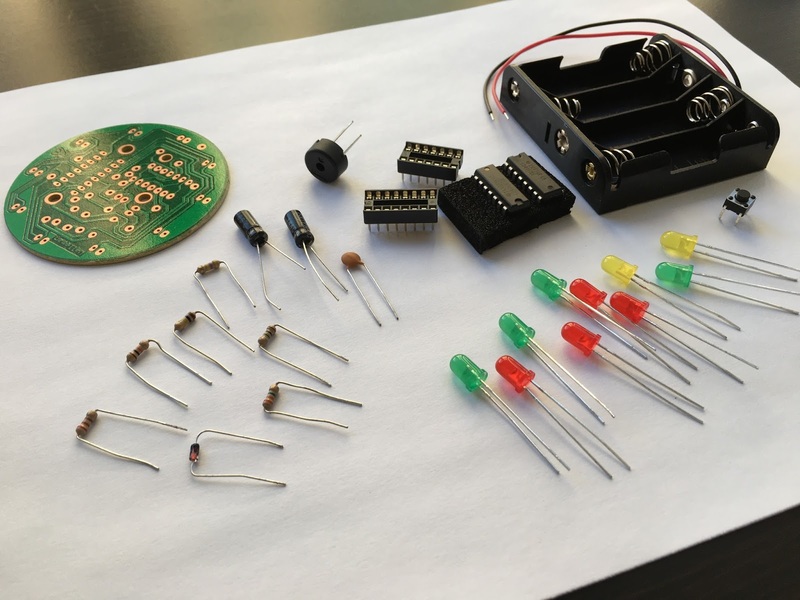 Fortunately, the higher cost of microcontrollers actually makes these versatile kits cheaper, so they wind up being an economical way to build up a parts collection too. 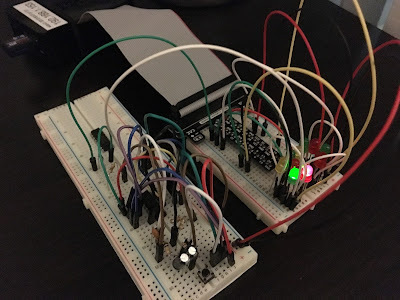 If nothing else, messing with this kit along with my Raspberry Pi was a good excuse to get familiar with basic electronics and get in some practice programming GPIO. Assembly and basic testing fit into an afternoon, but there is still plenty of opportunity to experiment and expand after that.